Listen. –> Feel. –> Do. –> Speak. You can click here for more information about how to do that. In fact, as a confirmed word-girl, I’ve always thought that my words were more important than my silence. Working on my words was what I was always doing, even while you were talking. I might have looked like I was listening, but well… not so much. I was really formulating the next thing I was going to say. My heart was in the right place. After all, our Creator spoke everything into existence with His words. He expresses Truth to us in the Word through Scripture. In John 1, Jesus Himself is called The Word. If I listened without responding with “truth,” I thought I wasn’t being a good Christian. I thought that not setting you straight was falling short. But I was wrong. I’m finding that listening doesn’t necessarily mean that I agree. I just means that I’m listening. Period. I know this might be a “No Duh” moment for you, but it’s been HUGE for me. But what if I would have just listened? What could I have learned? What if I had been curious not furious, as my friend Cheri says, asking questions to try to understand instead of reacting with more hurtful words? Maybe I could I helped a hurt. Maybe I could have heard a perspective that softened my heart toward her. Maybe I could have even learned something that shifted my own dearly held perspective a little. Maybe none of that would have happened, but I would have done something else that’s still important. I understand that there’s a time to speak God’s truth, Scripture (not the same as our opinion or political rhetoric or a dearly held philosophy, remember? ), into conversations, but the right time might be in the second conversation or the third or the fourth. In the meantime, as I listen in love, I begin to understand. I build compassion. I earn the right to speak. In the coming weeks, I’ve got some amazing guest posts coming up including how to listen and talk to that difficult person in your life and how to handle a conversation when it turns combative. If you’re not already a subscriber, make sure to click here and enter your email so that you don’t miss a minute. I’m in the process of developing a more tender heart and a stronger voice. We'll build a community of women here who are growing in the same direction. I promise that I won’t start telling you what to think. I’ll be digging into how to think about our culture’s issues based on Scripture. Periodically, I’ll send exclusive content to subscribers, my friends who are learning with me. Become a subscriber today so that you’ll receive a weekly encouragement in your email box along with free special resources developed just for you. I love this. So very true. I am growing and learning that I don’t always have to speak. Sometimes just sitting and listening is the best gift I can give. but then there are times when I know I should speak… in those moments I am learning to pray, ask God to fill me with words that offer wisdom, healing, love, grace and mercy.. a dance … the best description. Humbling ourselves as Christ did to serve in love.. thinking of others… Phil. 2:3 Do nothing from selfish ambition or conceit, but in humility count others more significant than yourselves. What a wonderful devotion and one I truly needed to read. Trying to “listen” to my wayward daughter and not want to input all of the things you mentioned is very difficult. But I am going to practice your suggestion. God is in control and maybe if I listen to Him, I can learn to listen to her. Thank you. I learned so much from this post! I too would have just started to give that woman a piece of my opinion as I appear to do quite often (or as I am often told I do). I am prone to doing this with my young adult son, I am going to be working on doing more listening up front than spewing my opining which has pushed him away in the past. Great lesson and as you say, Practice makes better! Whew! Girl! I’m right there with you concerning adult sons. Learning to listen and only “help” when asked is HARD after being in charge for so many years. I’m a work in progress but doing better. I really appreciate all the current blog posts that you are sharing. This one really hit me as I have a teen daughter who holds different beliefs from mine at this point. I want to just lecture her to get her to see that I am right but it doesn’t help our relationship. Her and her sister are also getting into more fights over opinions. So, I really looking forward to talking through some of these comments and how listening is love, not agreement. So, thank you! I’m so glad we’re learning together, Jenelle! Praying for you and your daughter right now. Parenting through the teen years isn’t for the weak of heart. I’ve been there! Amy, your words have spoken volumes to me today. Thank you so much. I’m so thankful. Thanks, MaryLou, for always encouraging me! I don’t think anyone could fault you for feeling the need to defend yourself against what that woman said. If she had called you the B word or criticized your blog or something else that just showed her lack of taste, that’s one thing. But undermining your Christian walk is truly another. Remember, even Jesus had righteous anger. I respect you for having a change of heart to your response, as I often do myself, but I truly believe we must stand up for ourselves sometimes too. If we don’t, who will? We all need to be more careful with our words, and perhaps that woman realizes it now. Crap. Maybe I am a terrible Christian too. Suzy, I can tell we have like spirits. I’m always the one who wants to punch somebody in the nose when they hurt someone else! 🙂 I know myself well enough, though, to know that I responded to that woman before I heard from God about how I should respond. If I had to do it all over again, I would have simply deleted her post. As I’ve processed how to have hard conversations without being a doormat, here’s what I came up with: https://amycarroll.org/rules-of-engagement/ Do I feel a little too giddy sometimes when I hit “delete”? Maybe! LOL! This is a huge revelation for me too. I often feel stressed out about not listening well and when is the time to correct someone. I don’t listen well. 😱. I’m lookunt forward to your upcoming posts. Thanks so much, Holly. I’m glad we’re on this journey together! I love this Amy! 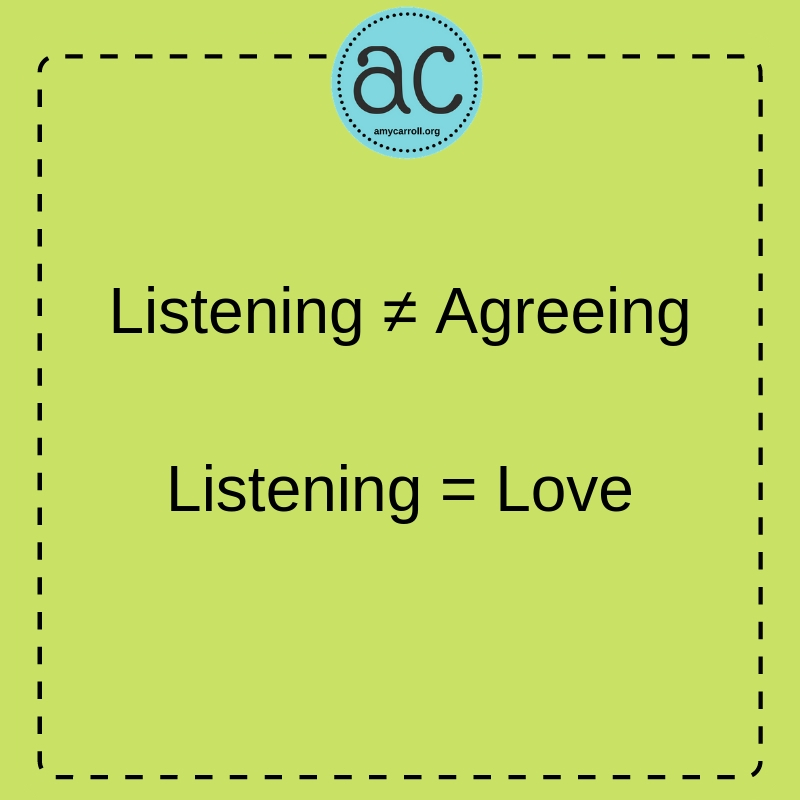 Listening = Love feels so true! Thanks for your thoughts on this and for your honesty about your own struggles! Ouch and yes! My nature is to jump first, then look around for collateral damage. Listening has never been my strong point, but I am learning. Listening in love opens up conversation instead of condemnation. Thank you, Amy, for helping us half listening girls to love in the listening. Conversation instead of condemnation. SO GOOD! I’ll send exclusive content to subscribers, my friends who are learning with me. I’d love for YOU to be on the launch team for Exhale! See deets below.